I Love You Messages for Ex-girlfriend: Still have feelings for your ex? The best way to do it is to be subtle and cryptic. Without taking any names or tagging anyone, start posting romantic quotes on your Facebook and Pinterest. Use Twitter to express how sad you are. Hopefully she will notice the stuff you’re posting and get the hint that your heart still beats for her. Touch base with her by sending a sweet text after a few weeks into your frenzy on social media. If you want to be really direct, forget the fluff and just write your heart out on a cute note and give it to her in person. But before you do any of this, be sure that you really want to go through the nightmare all over again after your breakup. It might not be the most pleasant surprise for a girl to get a message from her ex-boyfriend. Getting back in touch after breaking up with her can lead to unnecessary complications, humiliation and even embarrassment. Do it, only if you are sure that you want to get back together in a relationship with her. 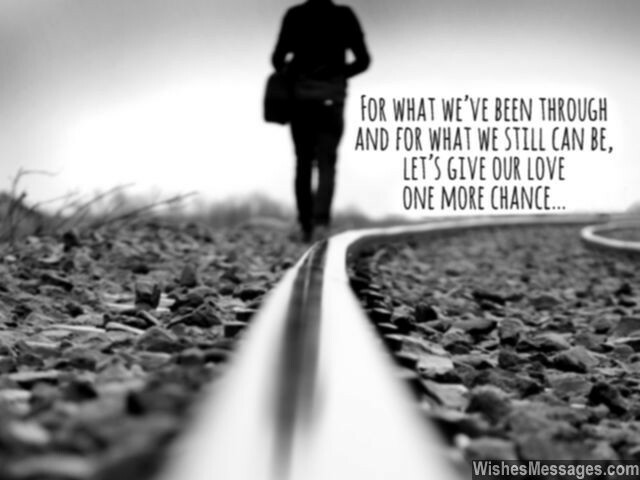 1) For what we’ve been through and for what we still can be, let’s give our love one more chance. I love you. 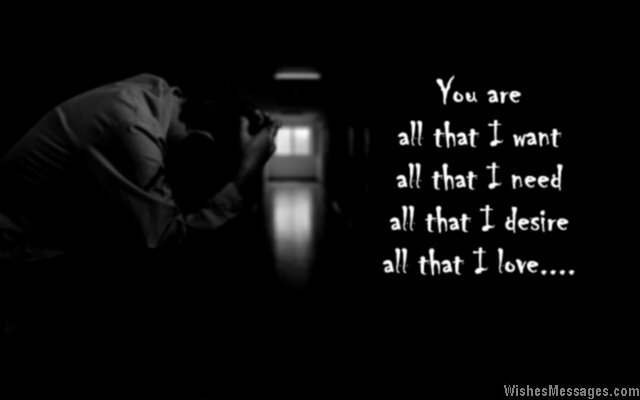 2) My heart says it can’t stop loving you, and I beg you to listen to your heart too. I love you. 4) Our relationship may have reached its use-by date, but my love for you hasn’t and never will. I love you. 5) Loneliness is the raging fire in the midst of which I’m trapped. Heartbreak is the dark abyss in which I am drowning. Regret is the tornado that is wreaking havoc and tearing my life apart. Still, I stand strong clinging on to the only thing that will help me survive through this all – my love for you. 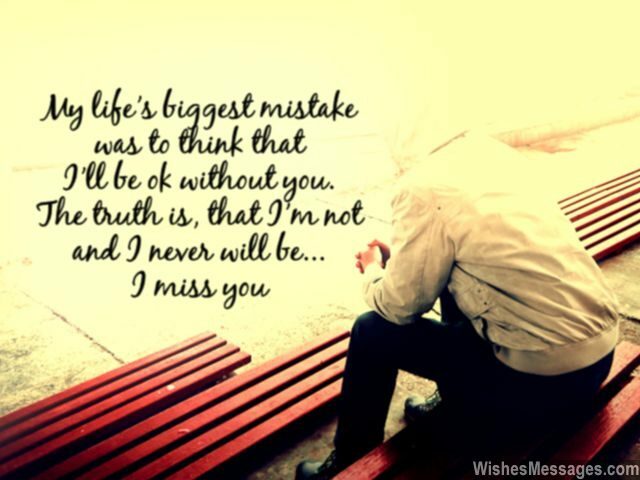 6) My life’s biggest mistake was to think that I’ll be ok without you. The truth is, that I’m not and I never will be. I miss you. 7) We broke up the other day but I still haven’t been able to break up with our memories. I think I still love you. 9) I’ll trade a lifetime of happiness for just one long hug with you. I love you. 10) I haven’t gotten over the pain of being away from you, and I don’t intend to. All I think about is that one day I’ll wipe my tears and I’ll see you. 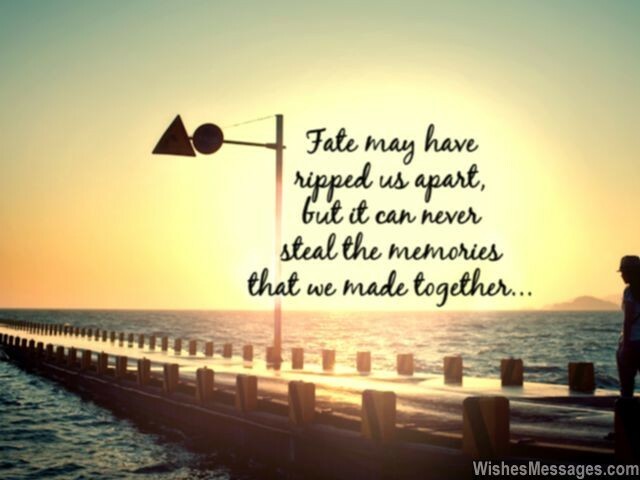 11) Fate may have ripped us apart, but it can never steal the memories that we made together. I love you. 12) I find it hard to believe that you chose to break my heart and walk away. But I still want you to know that whenever you decide to turn around and come back, I will always be waiting here with my arms wide open. I love you. 13) Just like how I can’t stop breathing even if I try, I can’t stop loving you no matter how much I cry. 14) The pain of heartbreak, I just can’t bear. Your absence, make me gasp for air. Shattered and broken, I feel without your hugs. The holes in my heart, I beg you to plug. 15) Even though our fights tore us apart, I have no regrets. My heart knows for sure that we’ll find a way to be together again. I love you. 16) I’m not asking for a lot. 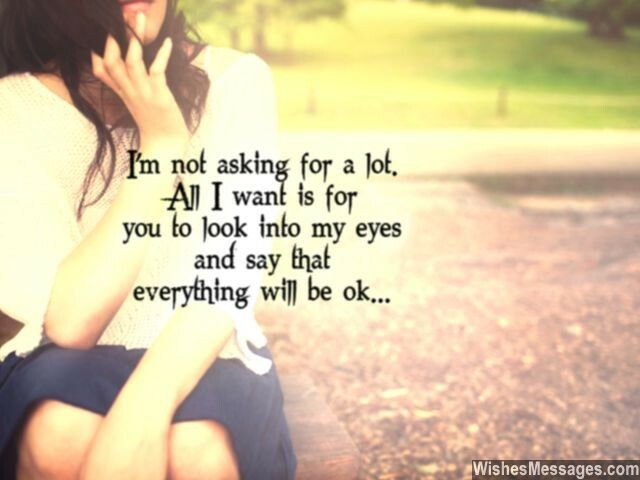 All I want is for you to look into my eyes and say that everything will be ok. I love you. 17) For the sake of all the promises we have made to each other, for the sake of all the dreams that we saw together… let’s give our love one more chance to last forever. I love you. 18) As every moment ticks away, the more I keep thinking about the past, the stronger I feel that our love is meant to last. I love you baby. 19) Our breakup should have shattered me but it has actually made me stronger, by making me realize that you are the one my heart wants. Girl, I love you. 20) You broke my heart but I’m not going to pick up the pieces. I know that one day, you’ll come and pick them up yourself. I love you. 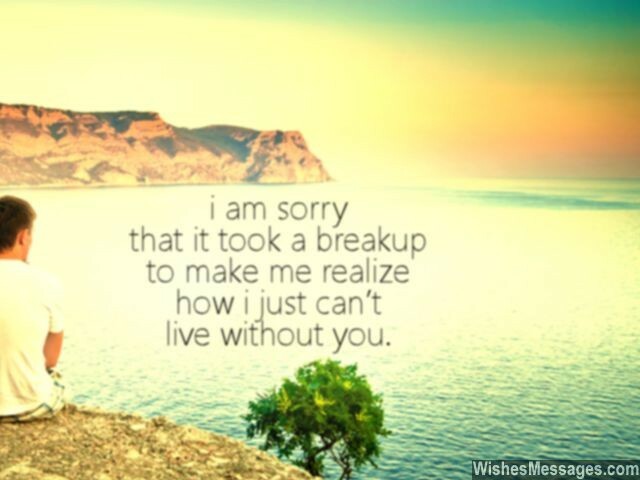 21) I am sorry, that it took a breakup to make me realize how I just can’t live without you. 22) I’m ready to take all the blame. I’m willing to accept that the fault was mine. I’ll do whatever it takes, to convince you that our love is worth the trouble. 23) I thought I would be better off alone, but I was wrong. I have realized that the core of my strength doesn’t lie within me, it lies if how you make me feel. I love you. 24) I am still thinking about you and I know you are still thinking about me. Let’s get back together and just embrace our love’s destiny. I love you. 25) Things that break can be fixed with glue, just like how a little understanding can bring together me and you. I love you. 26) You are all that I want, all that I need, all that I desire… all that I love. 27) I made you cry but that is never how I wanted things to be. I can’t change the past but I promise that I’ll always be the reason for your smiles, never your tears. I love you. 28) I don’t want to be your ex and become the reason for all your nightmares. I want to be, the reason for your sweetest dreams. I love you. 29) My heart has been shattered and my soul has been sucked empty. Baby I need your love, please come back to me. I love you. 30) Do you remember the first time I asked you out on a date? I remember it, because the happiest moment of my life was when you said YES. I know it’s been a long time since then and I know things are not the same. But I want you to think about all the awesome memories we’ve made together. Please, let’s put aside the shallow differences and look at the depths of our relationship that once was. I love you. 31) I know I have caused this mess. I know I have stolen your happiness. I know I have given you stress. But I truly beg for your forgiveness. 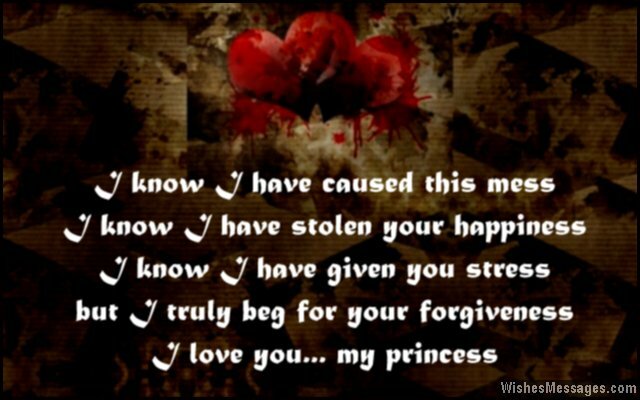 I love you, my princess. 32) I just want to hold you, give you a piggyback ride, hug you, laugh with you, look into your eyes and tell you… that I love you. 33) You are neither my ex, nor y, nor z, you and I are just meant to be. I love you. 34) It doesn’t matter whose fault it was or who takes the initiative to say sorry. What matters is that I want you to come back, because I just can’t stop loving you. 35) I never knew I could smile and cry at the same time, until the moment I looked at our selfies while crying myself to bed last night. I love you. 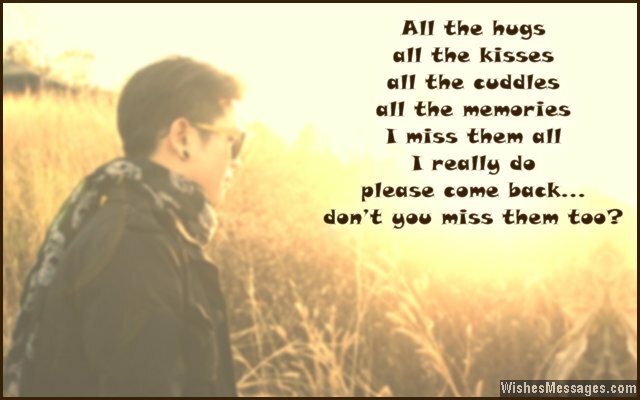 36) All the hugs, all the kisses, all the cuddles, all the memories… I miss them all, I really do. Please come back, don’t you miss them too? I love you. 38) I just can’t sleep, because I keep thinking about you all night. Please take me back, and set things right. I love you. 39) I am tired of looking at all our selfies on my iPhone. I want to get back with you so that I never feel alone. I love you. 40) My life is messed up. On one hand I’m bitter over how things turned out and on the other my heart is in a state of denial, refusing to believe that it has to stop beating for you. I love you.